In Part One we looked at the foundation of the light stand – the base, the column and the receiver. Those were the parts most people ‘get’. In this part we’ll cover the stuff that really makes the light stand shine. Important: Many of the terms used in this article are interchangeable, and vary from country and region. The only way to know for sure what these accessories are called is to show the picture to a few grips and then take religious notes. Cheaper photo light stands usually use plastic knobs or even latches, similar to those found on cheaper tripods. This single feature should tell you immediately the stand is not designed for heavy loads. A good C-stand will have metal T-handle knobs, and that’s that. The regular one is what you find mostly, and it is designed to be draped over the turtle legs of a C-stand. The doughnut is specifically designed for photo light stands just to add weight to the entire structure. It is not as versatile as the regular one. It goes without saying that you fill these bags with sand. Why sand? There are two substances you can use: sand or water. In equal volume, dry sand is heavier because it is denser. Both these are easily available no matter where you are on earth (almost). Water has the disadvantage that if not dried completely, it will help the growth of unwanted microbes and fungus or whatever. 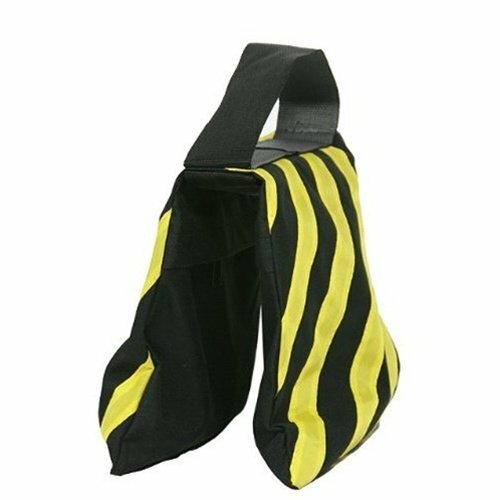 It can also leak faster, if your sandbag has a leak. Plus, save water. 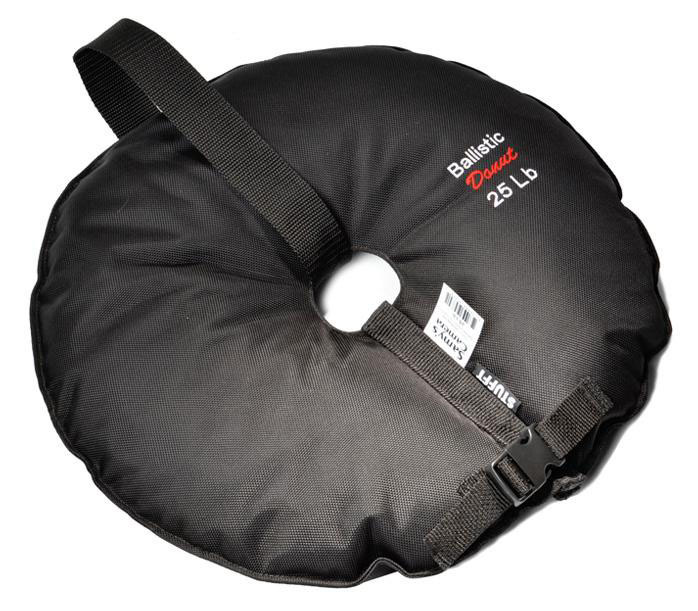 There is another important use for sandbags, and that is to balance the grip or gobo arm or boom. The sandbag is one of the most important accessories of a light stand and saves lives every day. If you’re buying light stands, you need to buy one sandbag per stand, no less. Maybe more. We have seen how adapters and receivers help hold up lights. 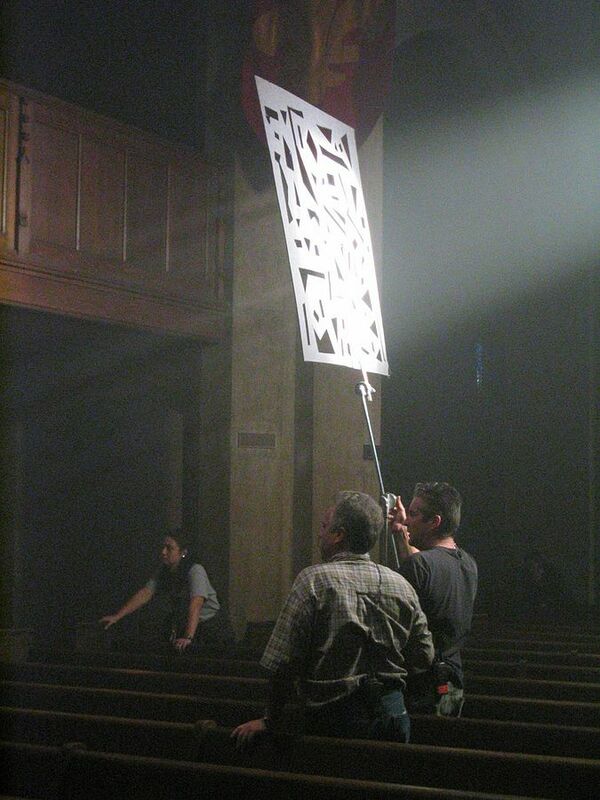 One of the purposes of a light stand we saw in Part One was that it had to move the light in the 3D space of the set. Well, what if the light stand is in the shot, or if a piece of furniture is blocking the way? 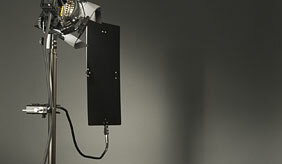 The grip arm is usually made of 16mm (5/8″) steel and is not primarily designed to hold heavy lights or gear. Cheaper arms are made of aluminum or cheaper alloys. The two most common lengths for grip arms is 20″ and 40″. They terminate in what are called grip heads. How is the grip arm connected to the light stand? Through the grip head. Rather than just adapt it directly to the receiver, the grip head not only allows the arm to spin 360o horizontally, but also vertically. It is this attachment that allows the grip arm to move in a full 3D space only limited by the length of the arm. The most usual grip head has two parts – the adapter that fits on the light stand, and a circular-looking thing with holes in it. This is the part that takes the arm, and a knob tightens it when the desired rotation is achieved. Grip arms also terminate in grip heads, so that you can attach more accessories to it if need be. It is at this point that our light stand suddenly becomes a grip stand. This is an important distinction, because it is almost always the same stand that is so versatile that it can be used in many situations. 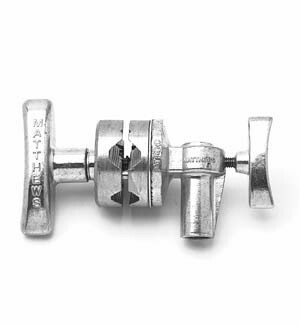 Most grip heads come with 3/8″ or 5/8″ holes to interface with stand-receivers and other common accessories. You also get heads for the junior receiver. They are also called 2 1/2 and 4 1/2 heads. Depending on where you are in the world, these terms might mean everything or nothing. Finally, there are standard grip heads, and micro grip heads for smaller arms. Why do grip arms and heads have to be so versatile? Keep reading to see all the stuff it is designed to hold. When a grip arm is too short, and you want a longer rod, you get a boom. 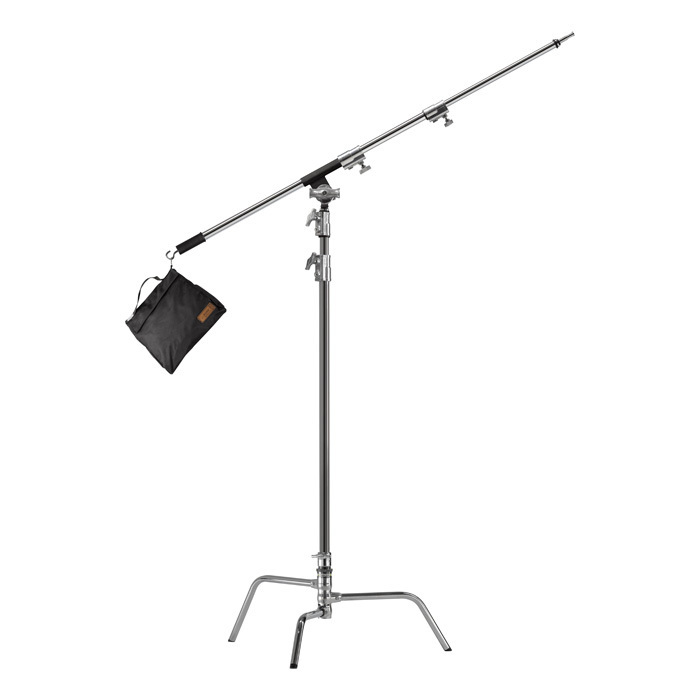 The grip arm is designed to stay close to the light stand, while a boom is specifically designed to reach far. The typical use for a boom is to boom a shotgun microphone, so the boom operator stays out of the shot. Booms on stands almost always need a sandbag to balance the load, or is a disaster waiting to happen. A holder is any accessory designed to hold something. The most important accessories a light stand needs to hold are probably a silk or butterfly (any kind of diffusion) to either diffuse light, reflect it (in which case it is called a Reflector, usually polystyrene) or block it (this last is called negative fill, and is usually black duvetyne cloth). These holders are like the yokes of light fixtures that allow the modifier to be tilted up or down to the right angle. Larger silks and butterfiles need two stands on either side. There are as many holder designs as there are devices – even for smartphones and tablets, ad infinitum. A T-bone is one thing, while a T-bone accessory to a light stand gives it a large T frame on the top so you can ‘park’ multiple lights or accessories and it all remains perfectly balanced down the middle of the light stand. When using lights, one focuses so much on getting light that inevitably one forgets that light also needs to be blocked. You can’t always control fixtures with just barn doors. For that you have flags, cutters or floppies. These are basically rectangular pieces of board or even metal and sometimes paper, usually black in color, to cut out light from where it shouldn’t be going. Since any movement of shadows will be perceptible on screen, a flag must be stationary, just like the lights. This means it must go on its own stand. One of the fundamental uses of a C-stand with a grip arm is to hold flags or cutters. These are metallic or weather resistant fabrics or plastics that serve the purpose of cutting down light. Moving the light away changes the quality of light, and dimming it changes the color temperature. Some lights cannot be dimmed beyond a certain point. Scrims cut down light without modifying the quality of light. These are ‘cutouts’ that give various patterns when a light shines through them. The most commonly used pattern is a window or tree, to mask the motivation of the key light (or whatever). They are also used to break up a blank wall into pockets of light. 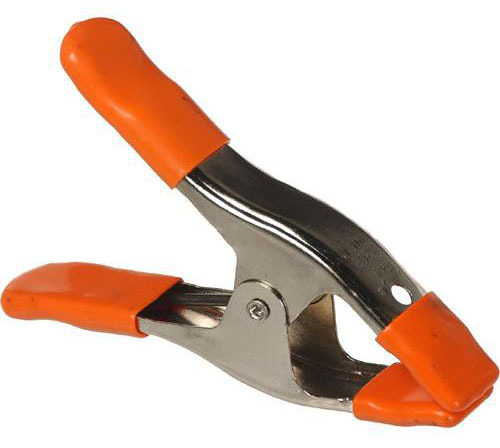 The design of this clamp makes it easy to hold on to almost any kind of fixture or support. And its tough construction ensures you can put some heavy gear (within reason) on it, including grip arms, magic arms, or what have you. Don’t get the knock-offs, because the plastic handles will just give up on you. 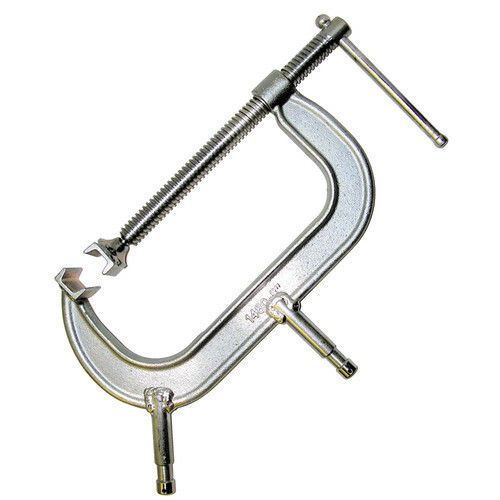 The C-clamp needs a ‘C’ for the same reason a hacksaw needs a ‘C’ handle, so it can go around tables or edges that are too long, yet still grip the surface like a vice. 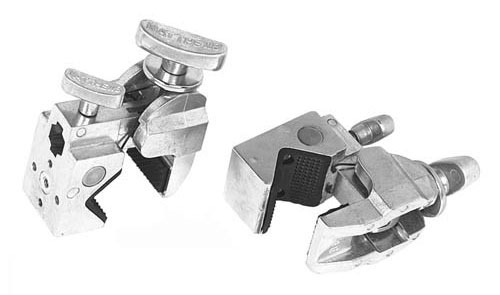 The A-clamp are straightforward clips, but heavy duty. C47s are light duty clips, but are extremely important in attaching gels, scrims, etc. to barn doors, etc. Ultimately, no matter how many adapters and receivers exist, there are always rigging challenges on set that only clamps can solve. Lighting without clamps is nigh-impossible. Remember at the beginning of Part One I told you about gear that you wish you had? Clamps will be right on top of that list. Ignore them at your own peril. This should tell you how easy it is to store and transport C-stands. Compare all the things we’ve covered in this part with the purposes of a light stand in Part One. Now you know why we need everything. 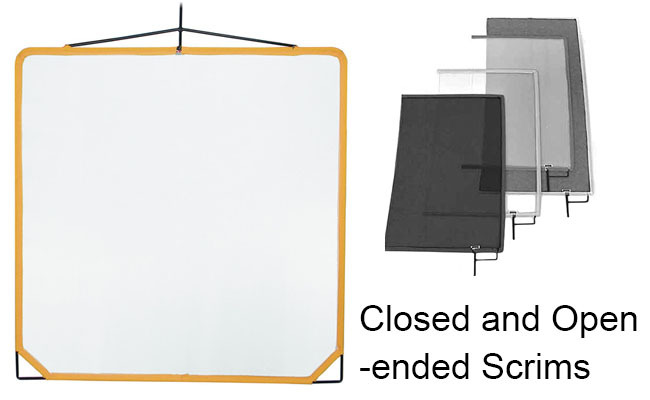 A single C-stand with arms and accessories will cost about about $300-500. A whole bunch with all the accessories, carts and a truck to lug it around will be well into five figures. Well, that’s it. I hope this comprehensive coverage has given you an idea of why a light stand is such a big deal on film production sets, and why you should pay more attention (and respect) to it from the outset. That $20 stand you can buy is good to get started, but don’t kid yourself that it can serve you for all purposes. 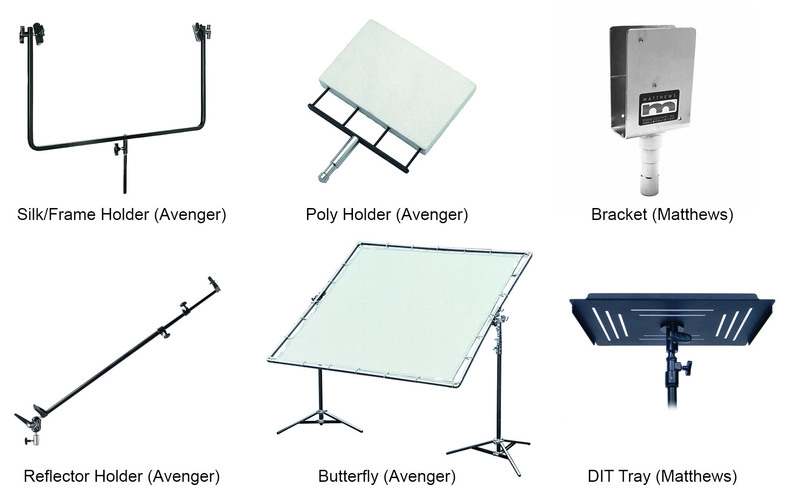 The only stand I know of that is versatile enough for any production is the C-stand, with all the accessories listed above. Without any one accessory, it wouldn’t qualify! 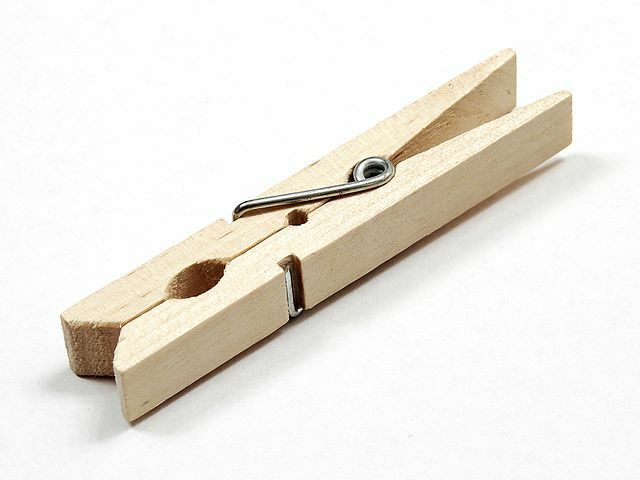 Investing in these is never a bad idea, because the good ones are made of stainless steel, and even when you’re old and your bones become toothpicks, these stands will be waiting in your closet ready for action at a moment’s notice.